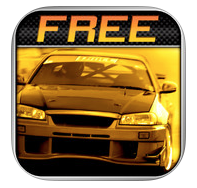 Well now that all (most) of us have updated to iOS 7, we can return to the wonderful world of apps with this review of Drift Mania Championship Gold Lite, the free version of this car drifting game. In Drift Mania, the object is to complete tracks (with lots of tight turns) by drifting around the curves. Your time, speed through curves, and “style” are taken into account to compile the score. Certain score thresholds for gold, silver, and bronze are listed for each track. This free version comes with two tracks (5 in the full version) and three cars (7 in the full version). All available tracks and cars are unlockable as you progress through the game. Driving the car is fairly straightforward: a throttle slider on the right side of the screen controls your speed, while a handbrake in the left corner will slow you down pretty quickly. You don’t have to worry about shifting (unfortunately… that would be pretty awesome) or really anything else. But learning the skills involved in entering a turn and drifting around it may take some getting used to. The game looks pretty crisp in terms of graphics, but nothing spectacular there. This is a nice free sample, letting you play a little bit and leaving a majority to the paid version, but it was not an inspiring play. I do not in any way feel obliged to grab the full version now, although keeping this free one around for occasional use from here on seems like the most appropriate choice. Not a bad game, but it still leaves a lot to be desired. 6/10.